We just love this print. 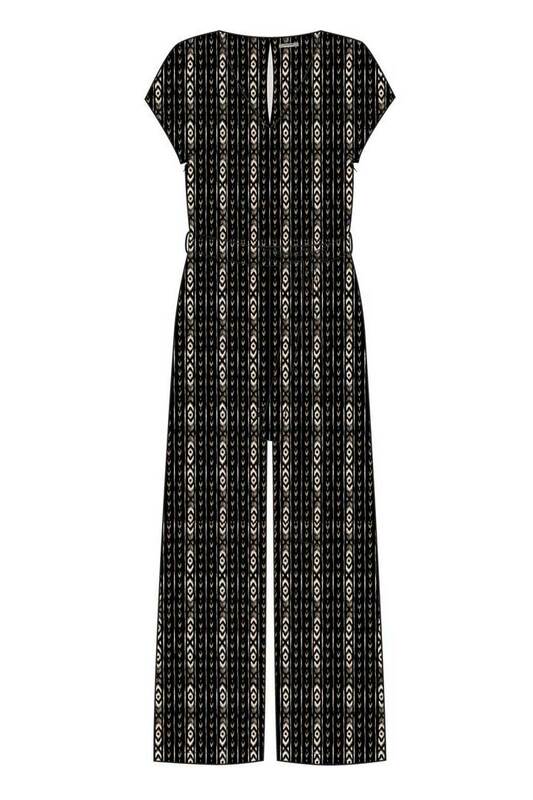 The Hailey jumpsuit is an easy to wear style as it has an elasticated waist that sits just right on. The aztec print is lovely for day or for night. This really is a great shape, it skims over your figure without being too baggy or tight. The v neck provides a good shape on a bust and being black based, this jumpsuit could be worn during the day with flats or dressed up for night with heels. If you are not completely satisfied with your purchase, simply return the item or items to us in their original condition within 14 days of receipt. We will issue a full refund (excluding original delivery charge if applicable) on receipt, or exchange the item for a different size / colour if preferred. Some products are non-returnable for hygienic reasons; these will be clearly marked. If a discount was applied to your original order, the amount refunded will be adjusted to allow for the revised order value and appropriate discount level.